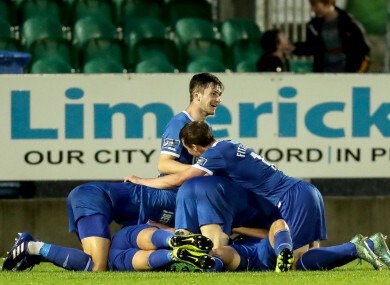 Limerick players celebrate Shane Duggan's late winner at the Markets Field. SHANE DUGGAN HIT a goal of the season contender to upset the odds in a zany Munster derby at the Markets Field. The Limerick skipper struck with just five minutes remaining after an opening hour that had to be seen to be believed. Waterford made three changes to the side that fell to Shamrock Rovers last week – including the introduction of Noel Hunt in place of Ismahil Akinade. Limerick were cruelly denied last week in Inchicore, and Karl O’Sullivan was the only player to lose his place – to the returning Cian Coleman. The sides played out a 6-3 scoreline in the RSC earlier in the season and this first half was equally if not more dramatic. After just 90 seconds, Killian Brouder lost possession to Noel Hunt who was dragged down by Eoin Wearen. The Dublin native was issued his marching orders by referee Damien McGraith, who would be a busy man throughout. Tommy Holland had big boots to fill following the departure of Brendan Clarke from Shannonside, but he gave a good account of himself in Inchicore and managed to make a superb save to deny Blues skipper Paul Keegan. As the game progressed, Limerick held their own despite the numerical disadvantage and they were given their just rewards ten minutes before the half. Will Fitzgerald tormented Dessie Hutchinson down the left flank and was dragged down by a clumsy Dave Webster inside the box after skipping past challenges in the build-up. Billy Dennehy stepped up to the spot, but he was interrupted by goal music. He brushed off the accidental button-pushing and coolly converted past Matthew Connor. The game appeared to be set up for a Waterford onslaught, but Webster would strike once more – going in hard on Connor Ellis before being issued with a second yellow card before the break. Despite clearly having all the momentum, Limerick shot themselves in the foot early in the second half. They overcommitted to an attack that broke down and when the ball fell to Bastien Hery, he ran 70 yards untouched and slotted past Holland to level matters. The visitors huffed and puffed, but ultimately Duggan would be left with the decisive strike – stunning a lively crowd to enhance the Blues’ survival hopes. Waterford FC: Matthew Connor; Dessie Hutchinson, Dave Webster, Kenny Browne, Dylan Barnett; Paul Keegan (Carlos Wilson, 79); Stanley Aborah, Bastien Hery; Sander Puri (Rory Feely, 57); Noel Hunt, Courtney Duffus (Ismahil Akinade, 57). Email “Limerick joy as late Duggan wonder goal sinks Waterford as both sides go down to 10 men”. Feedback on “Limerick joy as late Duggan wonder goal sinks Waterford as both sides go down to 10 men”.